Over the last 20 years, William Cepeda has broadened the consciousness of Puerto Rican music worldwide with his Afrorican Jazz, an original concept he created in 1993, presenting highly sophisticated jazz arrangements combined with rhythms and traditional musical styles of Puerto Rico and the Caribbean. Since then, William Cepeda's seven-member band explores idioms from all over the world creating a dense mosaic of rhythms, a universal and challenging repertoire. Cepeda's surely gave birth to a new shade of jazz, revealing the multi-cultural richness and creative potential of Puerto Rican traditional music. 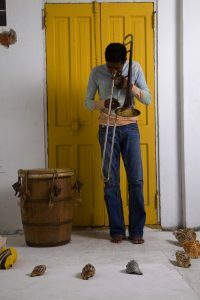 "William Cepeda's Afrorican Jazz swings between Africa and America; and the cultural mix resulting seems to come as much from Fela Kuti, than Mario Bauza or the Vienna Art Orchestra." Blaise Delay / 24 heures - Montreux Jazz Festival.